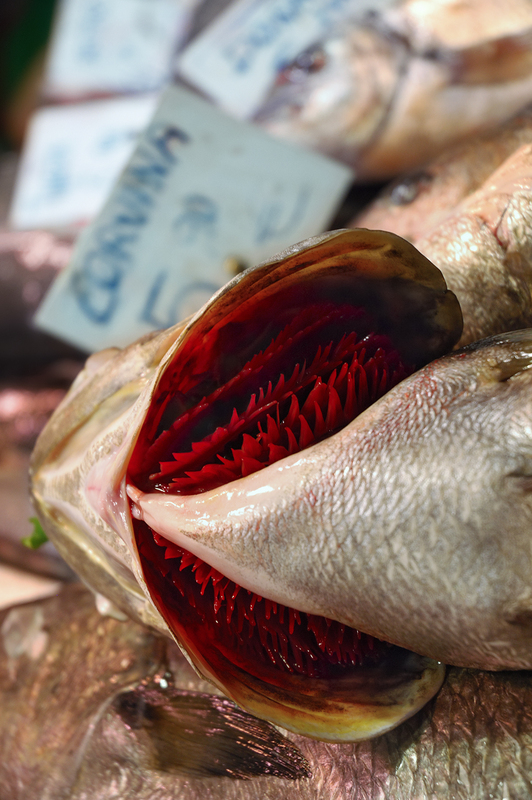 Today, another dead fish and for a change in La Boqueria market. Yep, posts are somehow fishy lately. Well, fishmongers must be glad, ichthyologists not much, and Barcelona fans, eager to watch other hot spots in the city, rather disappointed. I found the gills of this fabulous corvina extremely attractive so I thought, what the heck, one more for the blog before I say, so long and thanks for all the fish! That's an amazing image, it looks like a nice, healthy fish, it's almost flower-like. Did you buy that one and make him into sushi?! Question: How do you make fish gills look stunningly beautiful? Answer: When Carlos presents them to us. Wow, this picture has taught me something as a photographer. I NEVER would have thought to take this shot, but looking at it, it's absolutely beautiful! I mean it's not beautiful that it's dead, but it's beautiful how wonderfully flower like these gills were designed.